This entry was posted in Blog on April 18, 2019 by Walter van Suijlekom. This entry was posted in Blog on March 20, 2019 by Walter van Suijlekom. This is to announce a series of lectures delivered by Ali Chamseddine (American University of Beirut, Lebanon), who is visiting Radboud University Nijmegen this Spring as a Radboud Excellence Professor. All talks will take place in the Huygensgebouw (Science Faculty) of Radboud University Nijmegen. The first lecture (on March 26, 2019, 15:30-16:30, HG00.622) will be intended for a broad audience (with some background/interest in physics), and will be on the noncommutative geometry underlying the Standard Model of Particle Physics. Afterwards there will be a reception. In the second and third lecture (on April 2 and 9, 2019, 15:30-16:30 in HG00.622 and HG00.108, resp.) the formalism will be further laid out; these lectures will be more specialized. Below you find more detailed titles and abstracts. and provides the answer to “Why the Standard Model”. relation similar to Heisenberg noncommutativity of coordinates and momenta in Quantum Mechanics. unifies all interactions including gravity with the Standard Model the effective symmetry at low energies. factor is isolated in a covariant way where it will be traded for a scalar field representing the time coordinate. The celebrated theory of subfactors studied by V. Jones in the early 1980’s finds a connection with discrete quantum groups (duals of compact quantum groups in the sense of Woronowicz) through the concept of rigid C*-tensor category thanks to works of S. Popa in the 1990’s. The aim of this 5-days masterclass is to provide a comprehensive introduction to the subfactor theory as well as the combinatorics behind in order to understand this connection and highlight some recent applications. The masterclass will consist of three lecture series by Michael Brannan, Amaury Freslon and Stefaan Vaes, accompained by several problem sessions. Besides, there will be three contributed talks which will complement the topics treated in the mini-courses. This entry was posted in Blog on February 4, 2019 by Walter van Suijlekom. The conference will celebrate the mathematics of Gennadi Kasparov, publicize current work in operator K-theory and its applications, and assess future prospects. This entry was posted in Blog on January 22, 2019 by Walter van Suijlekom. The Mathematics department of Radboud University (Nijmegen, The Netherlands) has a vacancy for a tenure track assistant/associate professorship in Geometry (broadly interpreted). Initially this concerns an employment for six years. There will be a final evaluation after at most five and a half years. If the final review is positive the position will be converted to a permanent one. For candidates who are already further in their career an earlier evaluation is possible. The department aims at increasing the number of female academic mathematicians employed by the institute. Female candidates are therefore particularly encouraged to apply. The closing date is 10 December 2018. This entry was posted in Blog on December 6, 2018 by Walter van Suijlekom. The (newly established) Cluster of Excellence “Mathematics Münster: Dynamics – Geometry – Structure” is offering several Postdoctoral Positions and “Young Research Groups”. A “Young Research Group” is a group of two or three postdoctoral researchers with overlapping interests, who apply together to work within the Cluster of Excellence for a duration of up to four years. This entry was posted in Blog on November 14, 2018 by Walter van Suijlekom. Today my new preprint with Ali Chamseddine and Alain Connes appeared on “entropy and the spectral action”. In this paper we compute the information theoretic von Neumann entropy of the state associated to the fermionic second quantization of a spectral triple and show that it is given by a spectral action of the spectral triple for a specific universal function. 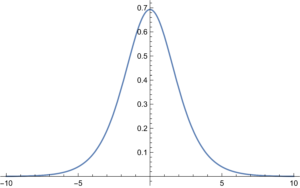 We find a surprising relation between this function and the Riemann zeta function. What this table of values also shows is that the functional equation gives a duality between the coefficients of the high energy expansion in even dimension with the coefficients of the low energy expansion in the odd dimensional case. This entry was posted in Blog on September 11, 2018 by Walter van Suijlekom. This entry was posted in Blog on April 4, 2018 by Walter van Suijlekom. This weeklong workshop will be an opportunity for young researchers in noncommutative geometry to share their ideas with their peers and with some of the leaders of the field. Apart from lectures by young researchers there will be mini-courses by Pierre Albin, Nigel Higson and Shmuel Weinberger. Topics will include the analysis and geometry of hypoelliptic operators, group actions on aspherical manifolds, index theory on singular spaces, and secondary invariants. Some funding is available for participants, and there are still opportunities for contributed talks. For further information, see the link below. This entry was posted in Blog on March 9, 2018 by Walter van Suijlekom.